Flexi-Coil has developed two series of air carts to suit differing capacity and metering needs, with all units designed to be easy to use, safe, versatile and fast to fill and empty. 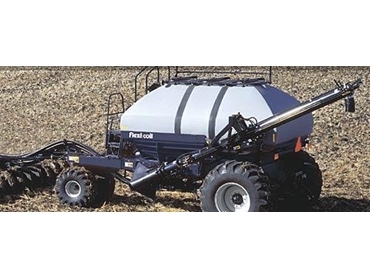 These air carts utilise a precision air delivery system that ensures seed and fertiliser are placed at exactly the rate chosen by the operator, providing the best possible configuration for successful crop propagation. They also feature carefully engineered components, providing added performance while delivering products efficiently, gently and accurately. Flexi-Coil air carts are available with a mechanical drive or variable rate technology, ensuring a model is available to satisfy any requirements. 40 series air carts provide easy operation, convenient in-cab control and a variety of tank sizes, with the option of towing behind or between. The 50 series has been developed for growers that need a larger capacity and diverse metering capabilities, with two or three integrated tanks allowing users to apply several products separately, blend on-the-go or utilise all tanks for full capacity distribution of a single product.